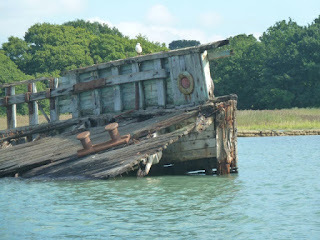 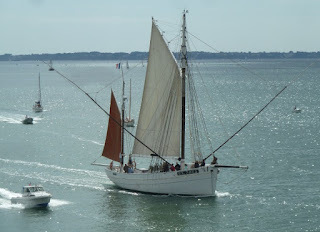 Things have been busy of late, so while we are actually in France, we're not in the Gulf of Morbihan , but we were back in the summer, so I thought we'd catch up a bit. 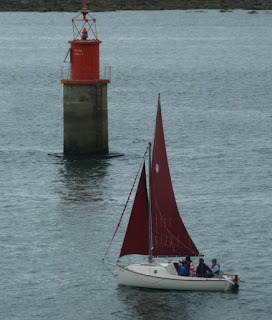 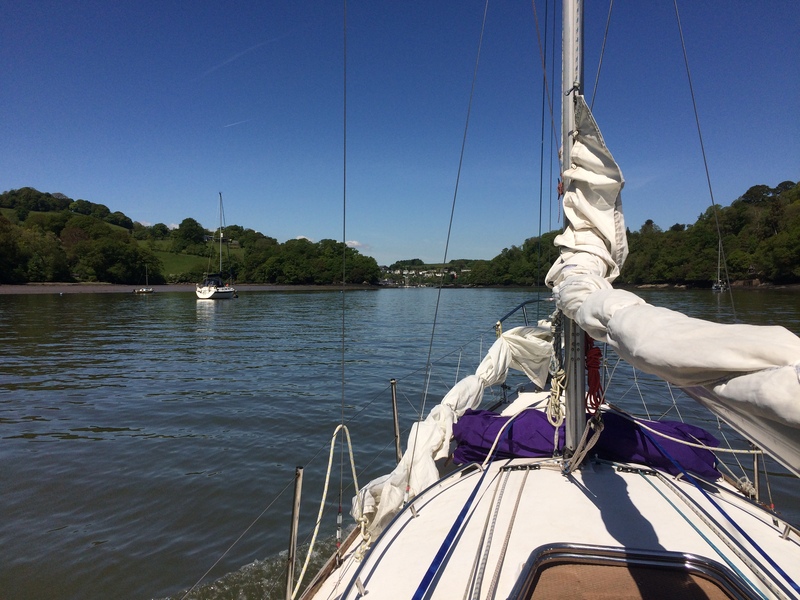 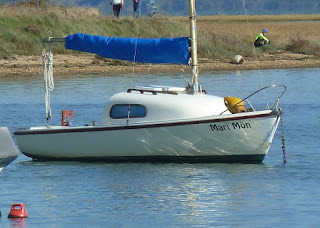 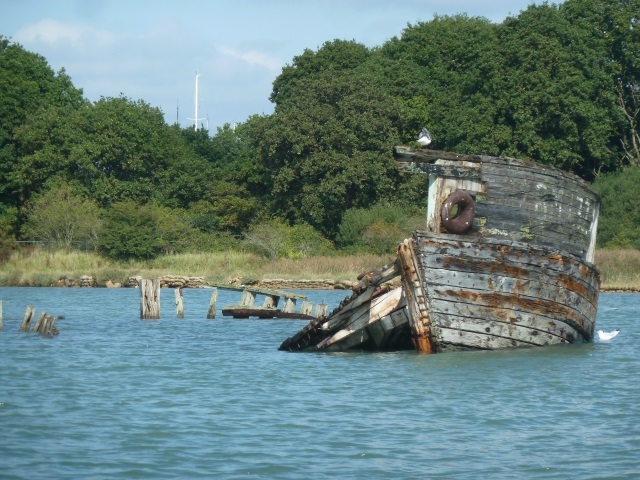 The Morbihan is just a great place to sail, admittedly the tides can be a little fearsome, but in terms of scenery the inland sea peppered with islands is hard to beat. 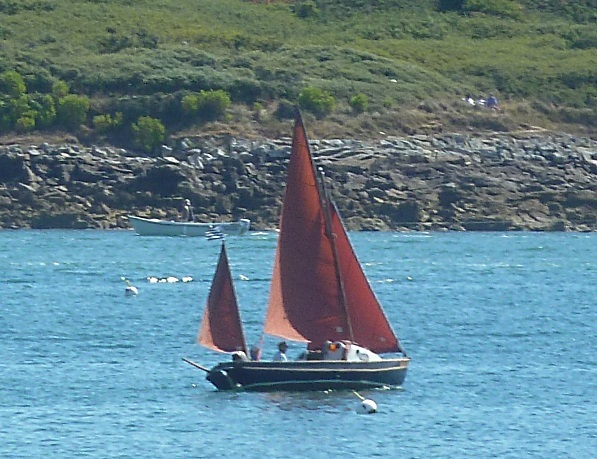 Below on a sunny Sunday a traditional yawl heads out past a smaller day boat - there's no substitute for waterline length. 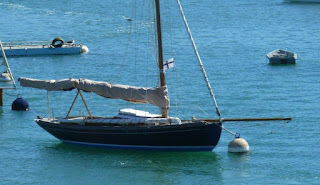 A Drascombe Coaster, hardly local but looks very much as home. 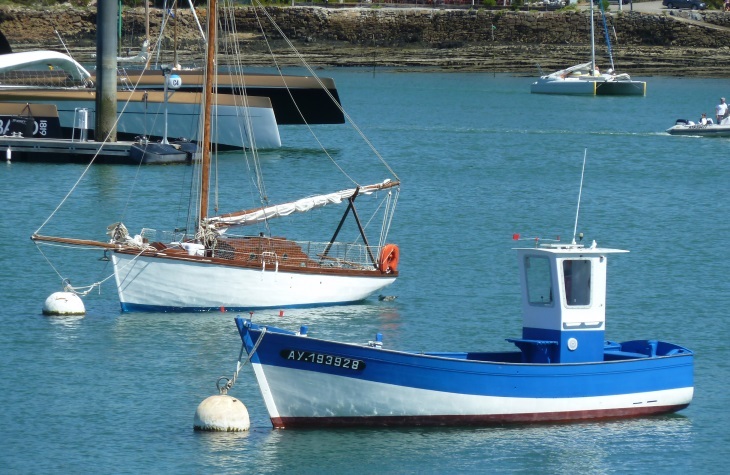 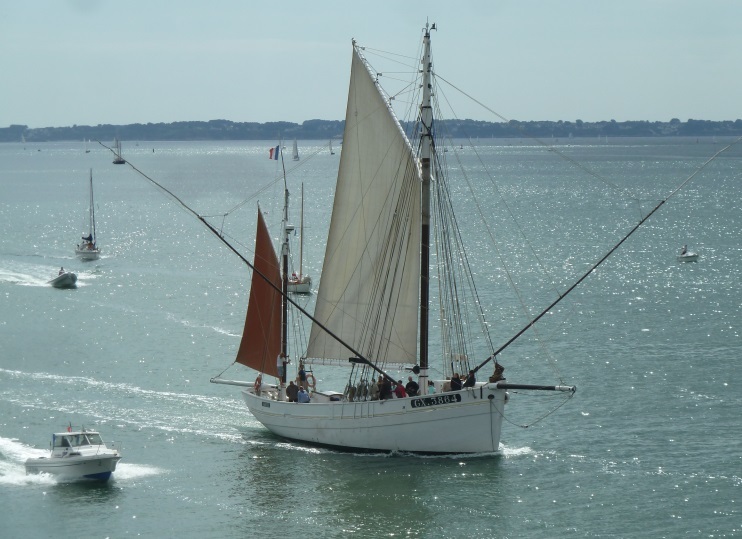 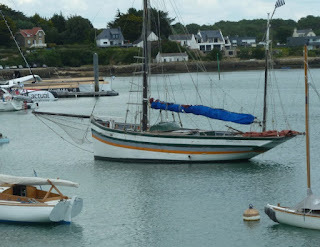 A classic day boat on what appeared to be moorings reserved for classic yachts near the quay in La Trinite sur Mer. 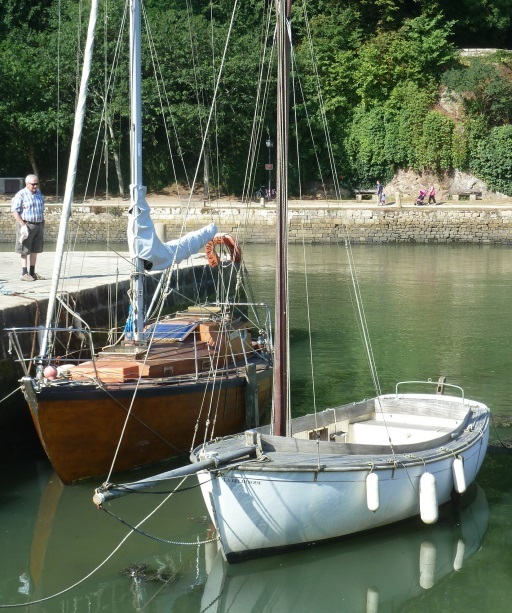 Our local harbour master would be rubbing his hands together at the prospect of charging extra mooring fees for that bowsprit and overhanging boom. 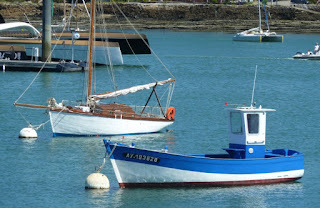 A couple more interesting day boats in the same area, protected by the fishing quay. 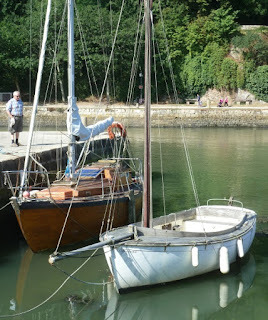 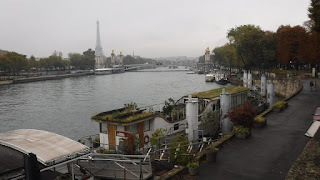 Our regular reader might recall my predilection for open day boats like the one in the foreground, absolutely lovely. 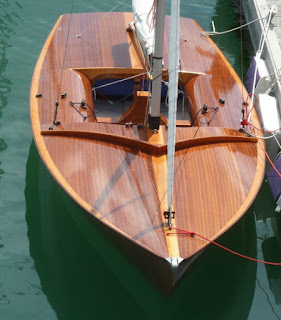 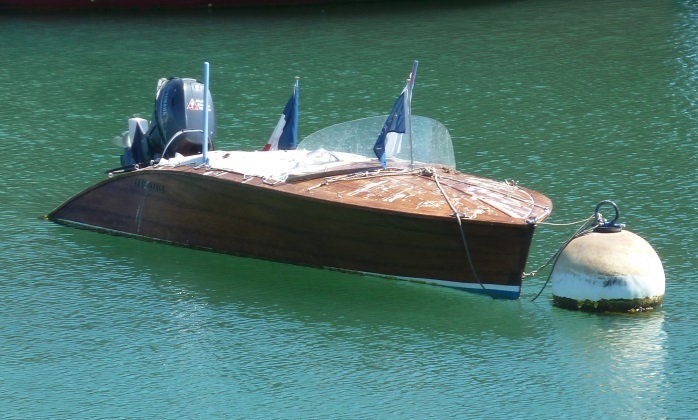 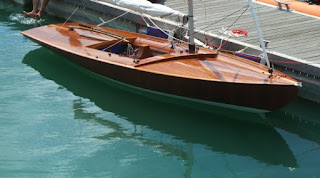 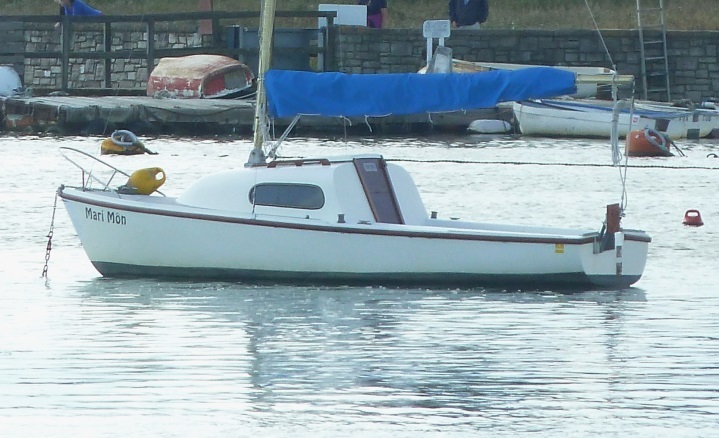 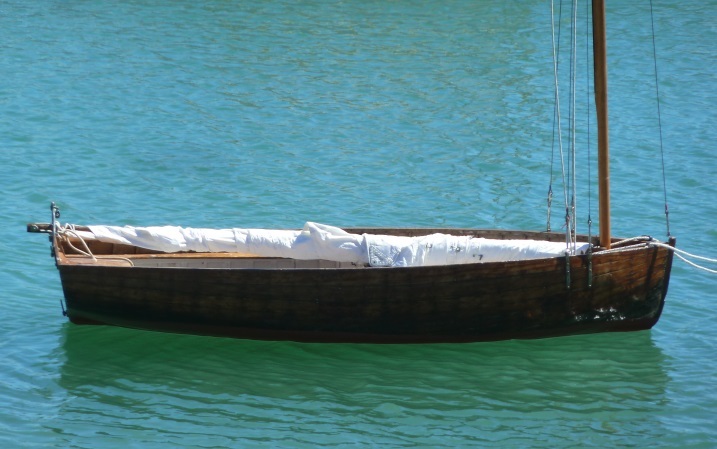 This is either a Francois Vivier designed dinghy (Ilur,or Aber?) 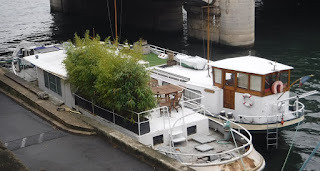 or a very similar local boat. 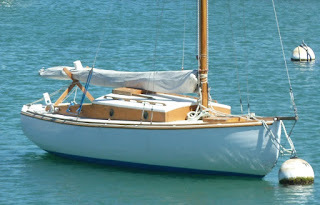 Presumably sets a single lug sail, probably without a boom, safe and allowing plenty of room for fishing and the like. Not normally a fan of motor boats, but this pastiche of a slipper launch caught my eye, the local seagulls seem to like it was well. 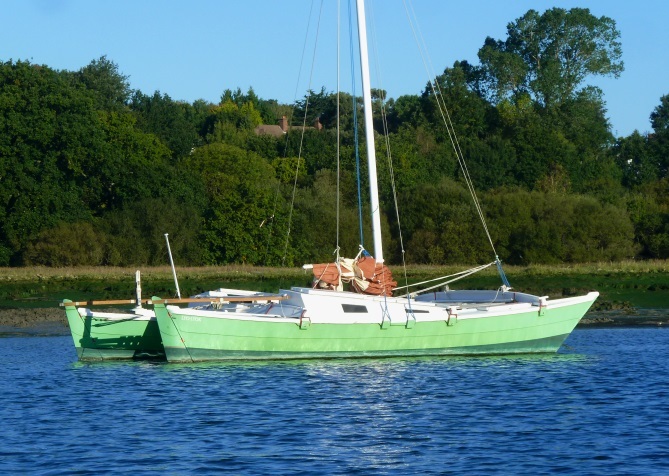 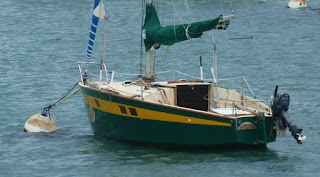 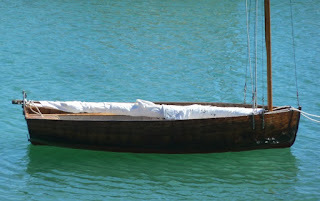 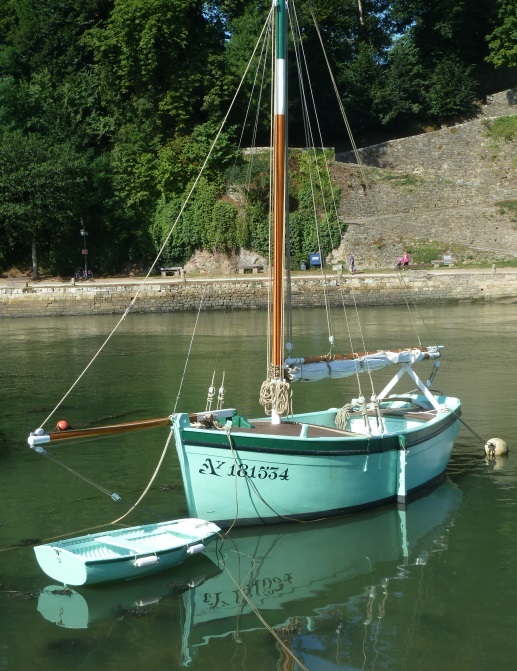 With apologies to Tom Wolfe, this mint green Warram has been looking very cool on a river mooring recently. 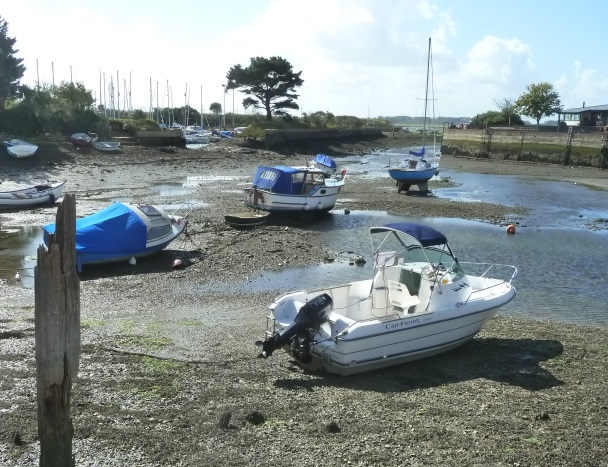 I kind of like the idea put of coastal trekking put forward by James Warram, but I think I'd probably want to do it in warmer waters. 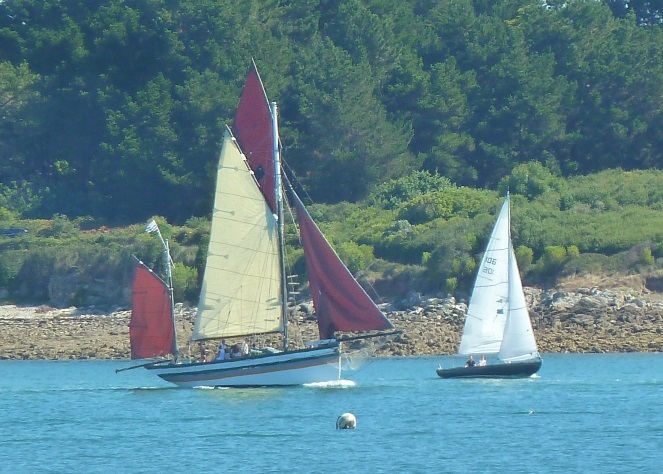 The Coastal Trek Camp designs cater for those who do not want a craft for long distance "ocean going" sailing, but would like to be able to trail their boat to varied interesting coasts and lakes. Port St Louis lies on the southern shore of the estuary opposite Lorient, the old fortification are a great place to look out on local sailing. 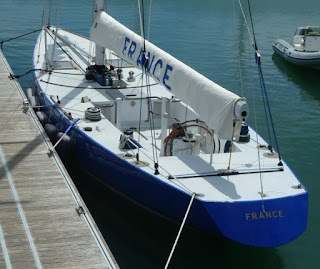 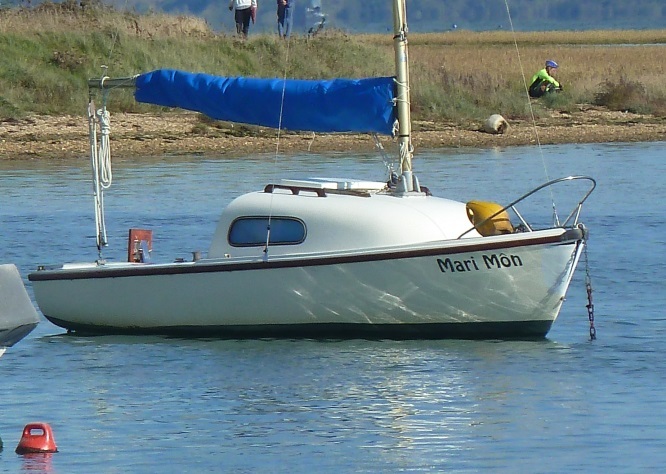 Above a Philipe Harlé designed Muscadet sits quietly on a mooring, a practical and very capable pocket cruiser. 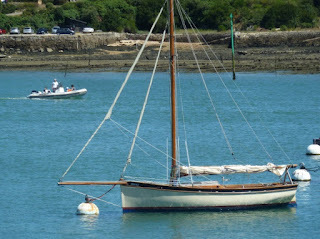 It's easy to see why they were and remain so popular. Below a modern gaffer which I think is a Skellig, ghosts past one of the very substantial channel markers. A restored and local fishing ketch approaching ports with fishing booms still deployed. 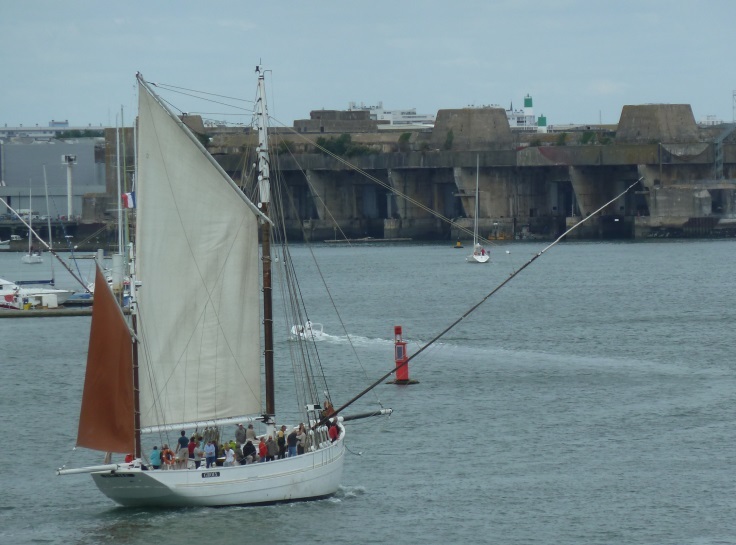 Going up toward the commercial port and main marina in Lorient with the WW2 submarine pens in the background. The extent of the summer storm damage was revealed when I rowed past at low water, showing pretty much all of the starboard bow missing. 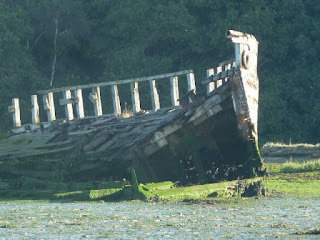 The deck has collapsed as the starboard side has fallen away. 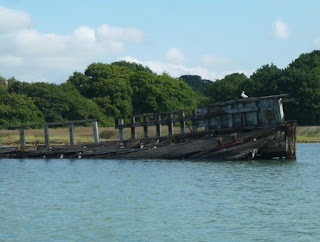 Earlier in the year my eldest son and I had kayaked around the wreck at high water and even talked about climbing on board to have a look around. Probably just as well we didn't. 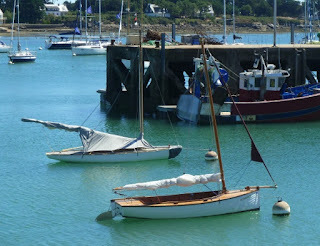 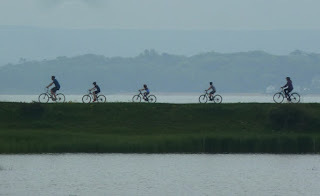 The days are rapidly growing shorter, the weather is getting noticeably cooler. 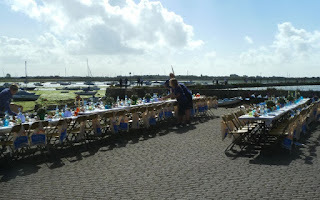 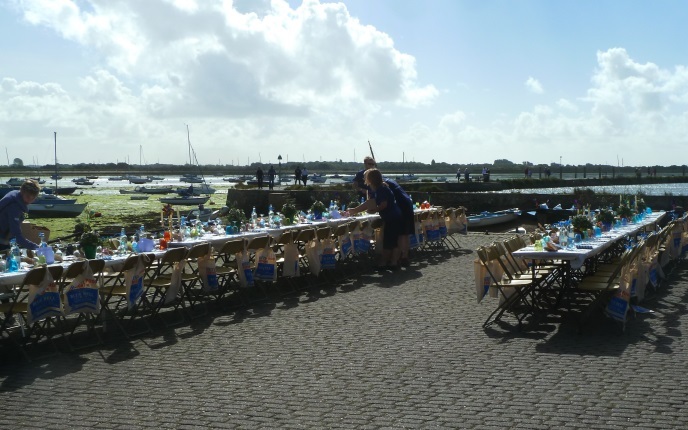 Down on the quay tables were being laid out for a seafood Sunday lunch as part of Emsworth British Food Fortnight. 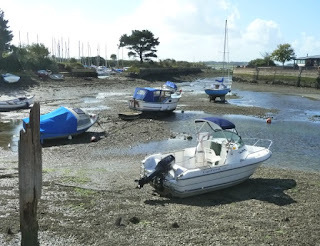 It's a time of high tides and of course low lows. 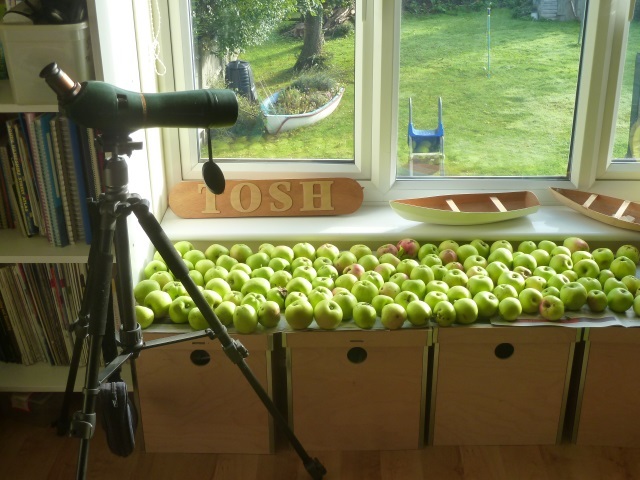 Apples collected from a local tree which grows wild and has deliciously sweet fruit, we need a trip out to collect the last of the season's blackberries and then an evening jam making. Saturday was the last Peanuts and Cadets session at Hamble River Sailing Club for the year, the morning rain cleared in time for HW and a photo opportunity to show off the club's new Optimists. 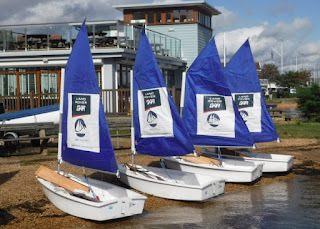 Many thanks to the sponsors at MDL. Our local wrecked MFV suffered significant damage during the August gales. From the river path the damage isn't really noticeable, but from the water the extent is revealed, the starboard bow has fallen away completely. 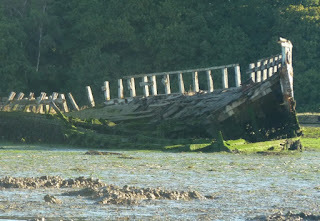 Along the foreshore a few of the fairly massive timber bulwarks have washed up, this view shows where they came from.